I have just installed a window into a family home in a village just outside Exeter which is currently being renovated. 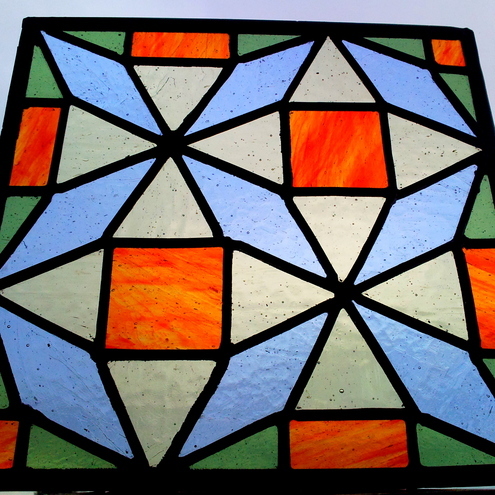 The panel is over 1 metre wide and serves several practical and aesthetic uses to the home. The window is an internal one and lies between the light, bright porch and the darker dining area in the kitchen and so I used lots of clear glass to allow the light through. Although the glass is clear it is waterglass as it has a great ripple which casts shadows like water ripples and it is also irridised to give it more impact. The commission brief was to create a simple, striking centre piece to compliment the entrance porch and the kitchen diner. The panel has 3 main elements; 2 of the panels are photographs fired onto the glass, these are of the clients children and the other a significant landscape to them. 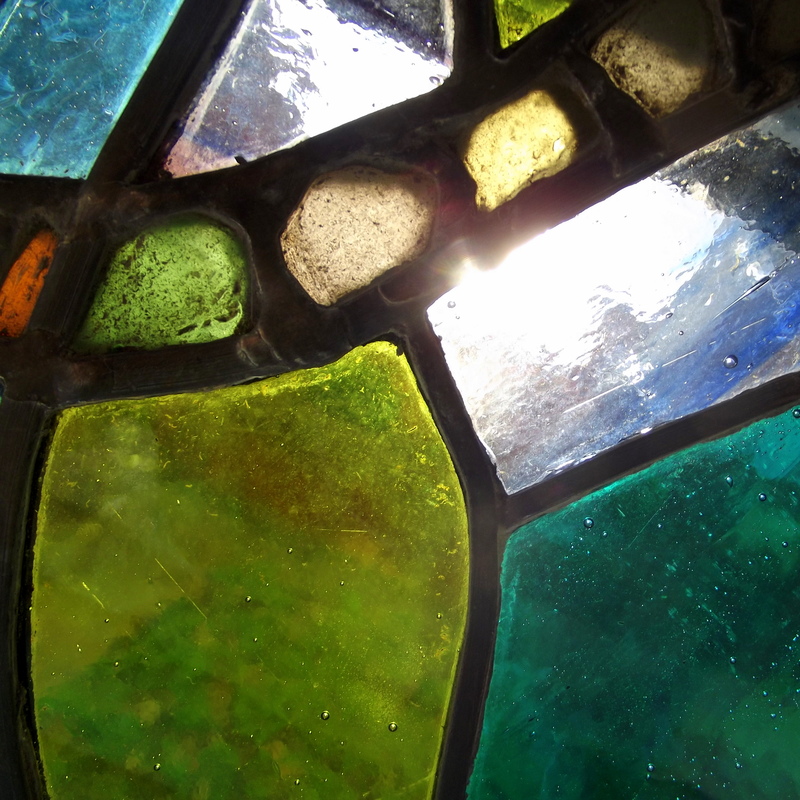 The central panel is made from small pieces of recycled glass fused together into a panel in my kiln and then fired again once I had painted on the intricate fern design. 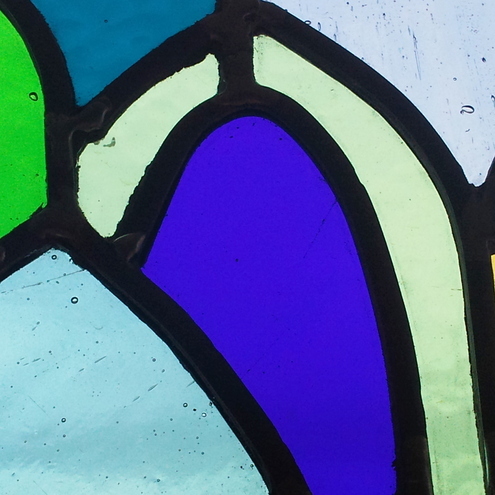 The colour scheme is simple, grey, yellow, turquoise blue and mauve glass surrounded with a clear irridised glass. This colour scheme mixed with the strong images gives the panel a really striking effect and makes an excellent wow factor as you enter the house through the front door. Too many ideas too little time! That’s my world at the moment, but some of them have come to fruition and I am very pleased with my new bunting designs. 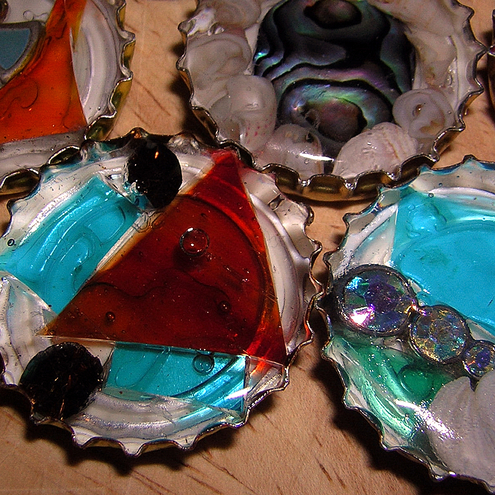 I have made some fused glass bunting reminiscent of waves breaking on the beach. 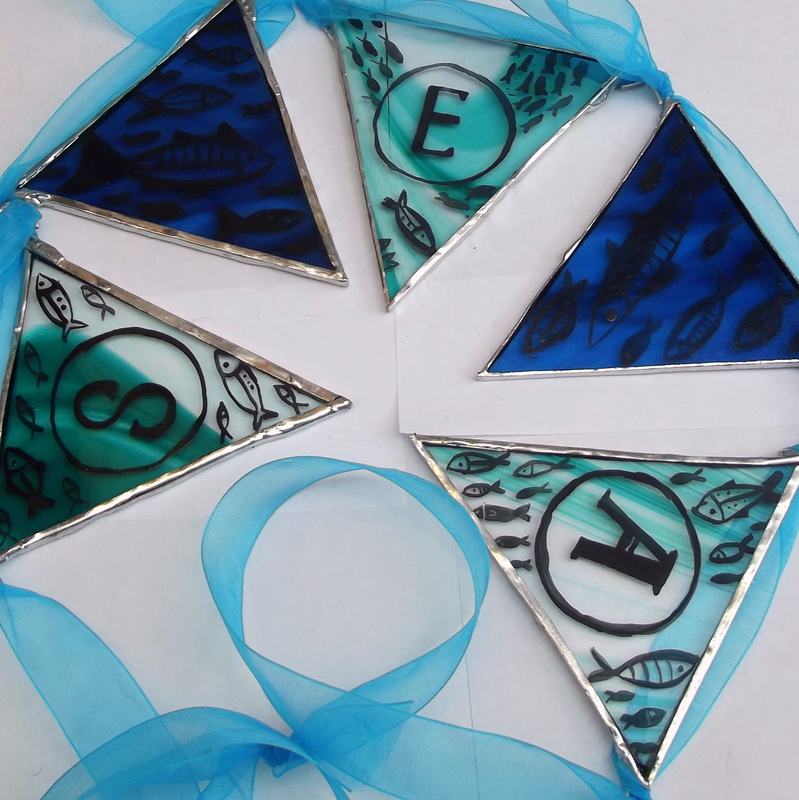 I have been experimenting with making my own recycled glass frit (ground up glass which is then fused in the kiln) this involves crushing waste glass into very small pieces (great fun with a hammer) and it is this ground glass that I have fused to create the texture on this bunting. 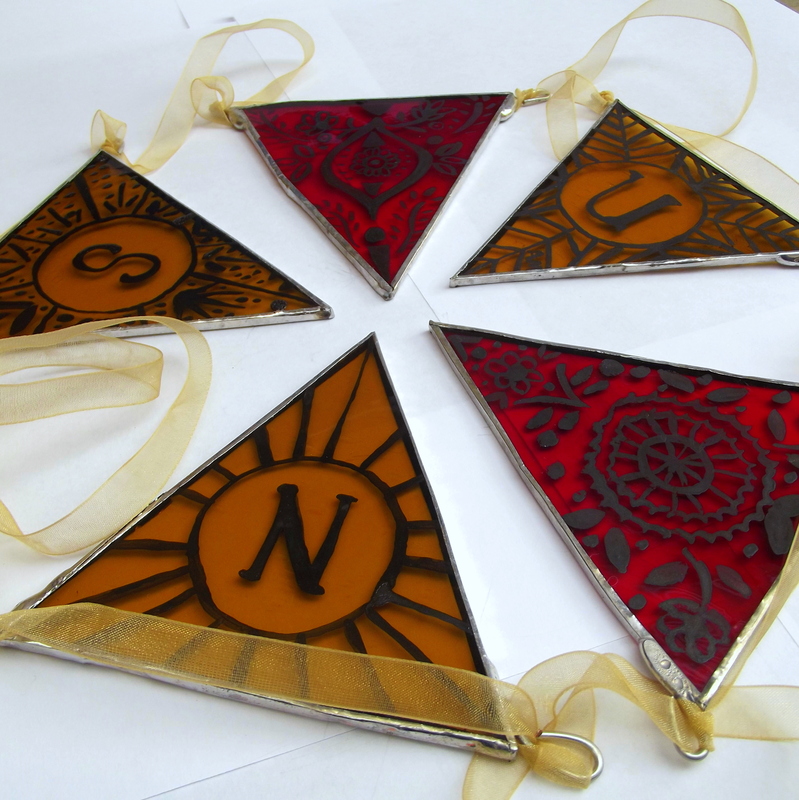 I have also been working on some painted stained glass bunting. These flags spell out various words (so far sea and sun) but there are more to come! They are just waiting their turn to go in the kiln! 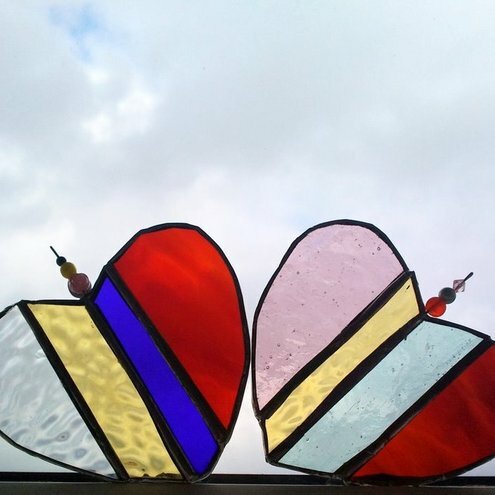 There are new panels on my website, new Dartmoor panels yet to be shown to the world (I am waiting for frames) and I am desperate to start my new glass casting with recycled glass experiments, but I have to work out the logistics of baby sitting my kiln for a 16 hour stretch before that can happen! oh and I am working on a second panel in my new series inspired by my children, which I am very pleased with, so I am generally a busy buzy bee, just the way I like it!